Ah, the entangled tale of two people bounded by fate, individual dreams, and eventually love. This is the story that A Star Is Born beautifully explored. It is not particularly new, hell, it is the fourth reincarnation of the film! However, Bradley Cooper’s exceptional direction and Lady Gaga’s powerful performance in her debut film set off the film to a bright spot! Jackson Maine (Cooper) is a successful country artist loved by many. Meanwhile, Ally (Gaga) is a server by day and a performer by night- a true struggling artist. They are coming from two different worlds yet through some twist of fate, their paths collided. One is drowned in success while the other strives to live a life. The immediate attraction between the two characters panned out believably. Gaga’s portrayal of a carefree yet insecure artist perfectly fits Cooper’s stardom-brought arrogance. The romance aspect of the story may be at the forefront but in reality, it just served as the backbone for the grim authenticity of fame’s price. Through a series of songs, we saw their relationship flourish into romance. The dynamics between the two actors flowed naturally that it made the audiences, or at least me, swoon. 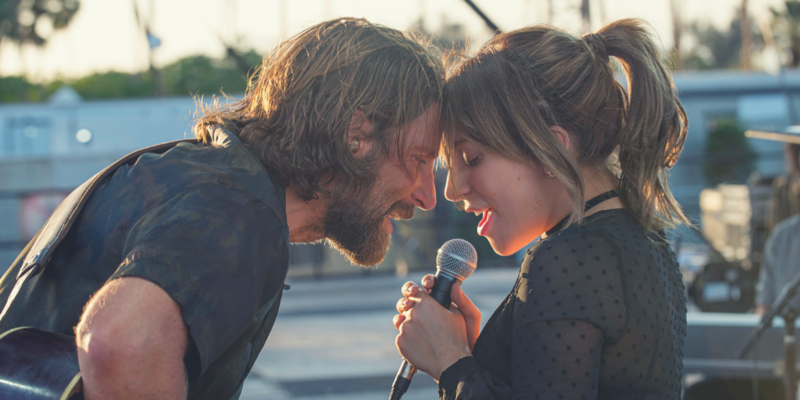 As this is not the first film to explore the consequences of stardom in any relationship, A Star Is Born played on the trope of paying the price. There is nothing to fear though, Cooper’s direction kept the film grounded on a solid footing. With much control and intimacy, the movie made the characters feel real, like real people. If there is one thing about A Star is Born that I particularly loved, well aside from the stellar performance of the lead cast, is the metaphorical play on the narrative. Do you know the thing about stars when one has to die for the other to shine? The story took it to heart and let every bit of it manifest in the narrative. At the start of the movie, it was Jackson who is drowning in fame and success. Then he met Ally who seeped her way to show business with his help and landed a Grammy. Their relationship was not left unscathed by the sudden shift in, forgive me, the alignment of their stars. Cooper’s character received a contemporary treatment by having it suffer with depression and alcoholism. As his wife Ally continues to rise to fame, he continues to sink in depression. Cooper shines the brightest at the second act of the film as it focuses more on Jackson’s issues. His subdued handling of the character worked well with the tone of the film. A Star is Born is a close to perfect film. The beautiful thing about it is how it balanced the glam of stardom with the unglamorous reality behind it. It does help that the stars were nothing short of fantastic. Lady Gaga and Bradley Cooper both delivered spectacular performances and vocals. Again, the base story is not original, there is no lie in that but the modern treatment is commendable. A Star is Born is one of the recent films where emotions flow smoothly through the characters’ ups and downs. Truly, emotions shine the brightest in A Star Is Born. Binge-level: 4.5 out of 5 stars.